The Parties exchanged views on the TRACECA Permit for international road carriage of goods through the territory of the member countries of the TRACECA Multilateral Permit System. It is mentioned that Tajikistan is still discussing this case internally. The discussion are also included the status of the extended projects, financial issues, further plans in view of TRACECA transformation into international organizations and possibilities of infrastructure and investments projects for development of TRACECA. 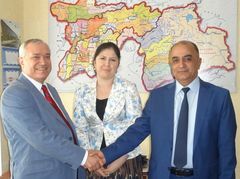 Mr. Muminov and Mrs. Yokubzada mentioned that within the realization of the TRACECA Strategic document - Master Plan for Tajikistan it is envisaged to implement the following project: International Logistic Centre in Nijniy Pyandj. Logistic centre “Nijniy Pyandj” with the area of 4 hectares envisages the creation of a modern logistic terminal which will initially serve only road freight traffic, but finally it is designed for serving multi-modal transport (road and railway), as well as performance of a number of functions, such as transshipment, storage and handling of goods, oriented at general container goods. The Logistic centre will become the gates for international export, import and transit container traffic and ensure storage and handling of consumer goods meant for the population of Khatlon oblast. During the meeting Mr. Ciopraga was informed that Tajikistan in the process of ratification of the Protocol to the Technical Annex to the MLA on Fundamental Principles of Railway Ferry Terminals Operation on the Balck Sea and Caspian Sea.